I am under the weather today, so I'll not take a lot of time for a story about my beautiful thing. I'll tell you more later. 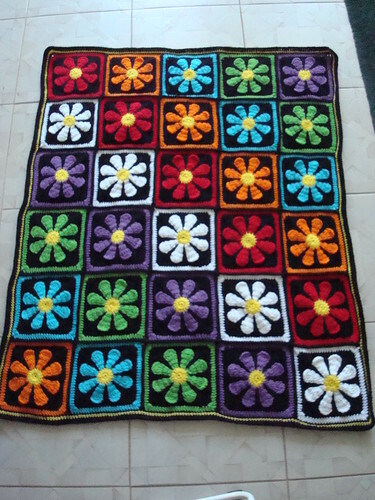 But I did want to show you my beautiful thing for the week--and afghan that I made for my sweet niece Zoe for Christmas. (Don't worry, she never reads her aunt's blog, so it'll stay secret.) I am so very proud of this one. I think it is beyond CUTE, just like Zoe herself. Here's a picture of it draped across a chair--more "true to life" if you will. I think this is gorgeous and I would actually buy it - and I am very very picky. 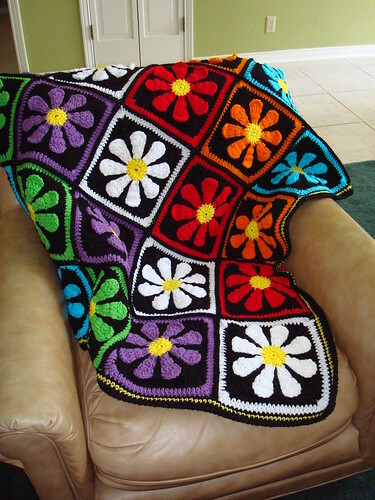 i am so lurvin the daisies. they are my favorite flower. it's totally coolmoe. The squares looked amazing when you were working on them but all together? WOW. I love it. We get to see it in person at the next craft circle, yes? This page contains a single entry by MamaT published on May 27, 2010 1:20 PM. smock's southernism of the day was the previous entry in this blog. Fine Art Friday is the next entry in this blog.